As this design was donated to the Public Domain as a public service by Mr. Kettlewell, anyone may use the ideas below to develop a Kettlewell Frictionless Mouthpiece. Player’s lips stay stationary on SLIDER, the SLIDER articulates back and forth on the BASE. No more friction of lips to metal mouthpiece. Lack of need to lubricate lips to effect movement to new note hole positions means that movements to new note hole positions are easier, and faster, which means new styles of play can be created. As Slider is played with dry lips, harp stays clean. Slightly richer tone to instrument. 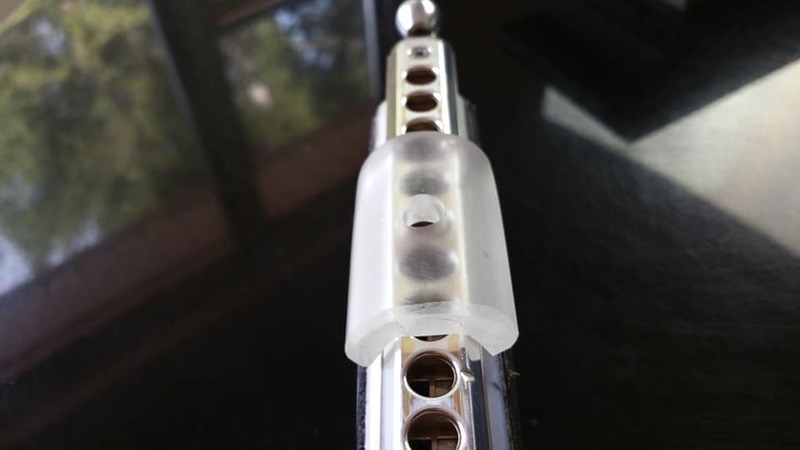 1) SECURE A PIECE OF LEXAN, DEEP ENOUGH TO COVER YOUR MOUTHPIECE, AND WIDE ENOUGH TO CLEAR YOUR HARP’S STOCK TRAPEZOIDAL MOUTHPIECE. You will use the harp itself as the MOLD to sand the final shape into the underside of the Slider. Sealing of harp: Remove the slider from your harp and lay clear plastic packing tape over the mouthpiece, overlapping onto covers. Now take painter’s blue tape and seal all around the covers and back of instrument. No grit should enter your harp anywhere while sanding. Using a squared off or slightly conical stone rotary attachment for your Dremmel tool, gouge out the underside of the Slider, creating a shape which matches the mouthpiece itself, but leave extra material as you will use sanding for final fitting. Starting with 100 grit very coarse sandpaper, cover the top of the harp mouthpiece with the sandpaper, rough side up. Now take the Slider you are shaping and hand sand it into the sandpaper laying over the sealed mouthpiece of your harp. You are trying to shape the underside of the Slider to fit your harp’s mouthpiece perfectly. This will take some time. Use progressively finer sandpaper as the shape is perfected, perhaps a fine as 500 or 600 grit to finish. 3) Shape the top of the Slider with a benchgrinder to create the shape you want to the lips. Now shape the sides and ends of the Slider with the benchgrinder. 4) Now put the final finish on the outer porton of the Slider your lips will touch. Sand vertically on the mouthpiece, creating tiny lines up and down on the Slider, use 120 grit sandpaper. Depending on how your benchgrinding went, you may have to start with a bit rougher sandpaper to remove grinding marks. End with 120 grit sandpaper. 5) Drill a single hole for a 1 hole slider, be careful that alignment of hole in slider is perfectly placed. Flute both the top and bottom of the hole using a larger drill bit held by hand and twirling. Perhaps smooth with 400 grit sandpaper so the hole’s fluted edge is comfortable to the lip. 6) Remove all the tape from the harp, and place clean 500 to 600 grit sandpaper over the harp mouthpiece, and perform your final sanding of the underside of the Slider. This is necessary to get a perfect airtight fit of Slider to mouthpiece. By using clean sandpaper and being careful, no grit will enter the harp on this final sanding. 6) Clean the Slider, apply Hetman’s rotary oil #13 lightly to the mouthpiece and test the Slider. You may have to sand the underside just a tad more with 500 or 600 grit sandpaper to get an airtight fit of Slider to harmonica mouthpiece. The process is about the same, except the Slider will need to be longer, and you will be drilling more holes. Always be sure to leave about 1/4 inch of Slider material past the last hole to either end of the Slider. NOTE that Sliders work best on airtight harps, that means you want a Seydel Symphony or Saxony harp, as these are airtight from factory. If you harp is not airtight, customize it to make it airtight as it will respond more sensitively to your breath. 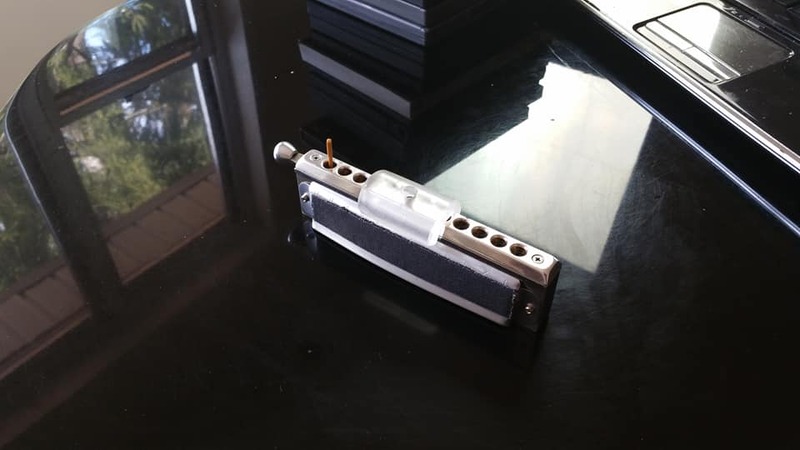 Instructions for this can be found on the Facebook Group CHROMATIC HARMONICA CUSTOMIZATIONS. This is a photo of a Slider correctly fitted to a Seydel Saxony. The clear Lexan came from a clear award I was given years ago, just sawed off a portion and shaped as above. Note that while the mouthpiece is trapezoidal, the upper surface of the Slider is rounded. I’ve found this design and configuration is most comfortable in play.